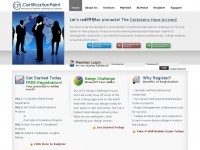 CertificationPoint.Org strives to be the standard in overall centralization of one's verified credential information for employers to find the best and brightest. We provide a secure freelance job marketplace (along with project management tools) for businesses, freelance professionals, & college freelance students in college as an opportunity to earn income. Copyright (c) 2014 CertificationPoint and the respective authors is the owner of the copyright for this website. three profiles were found for Certificationpoint.org in social networks. Among other social networks the website is represented in Facebook, Twitter and LinkedIn. The web server with the IP-address 192.254.251.77 used by Certificationpoint.org is owned by Unified Layer and is located in Houston, USA. This web server runs a few other websites, mostly in the english language. The websites of Certificationpoint.org are served by a Nginx server. The markup language of the website is XHTML 1.0 Transitional. Both the inclusion of the website in search engines and follwoing of its hyperlinks is explicitly allowed.